Last summer I traveled out to the wild west. 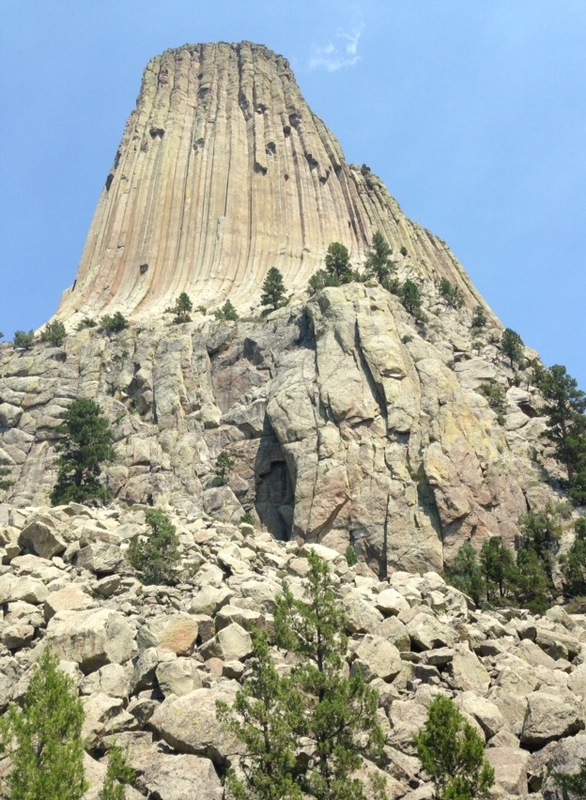 While traveling we stopped by this giant rock formation called “Devil’s Tower”. This large formation was more than just rock it came with a story, history, and a site for extreme adventure. Here is how the legend of Devils Tower goes. Long ago, two young Indian boys found themselves lost on the great prairie. They had played together one afternoon and had wandered far out of the village. Then they had shot their bows still farther out into the sagebrush. Then they had heard a small animal make a noise and had gone to investigate. They had come to a stream with many colorful pebbles and followed that for a while. They had come to a hill and wanted to see what was on the other side. On the other side they saw a herd of antelope and, of course, had to track them for a while. When they got hungry and thought it was time to go home, the two boys found that they didn’t know where they were. They started off in the direction where they thought their village was, but only got farther and farther away from it. At last they curled up beneath a tree and went to sleep. They got up the next morning and walked some more, still traveling the wrong way. They ate some wild berries and dug up wild turnips, found some chokecherries, and drank water from streams. For three days they walked toward the west. They were footsore, but they survived. How they wished that their parents, or elder brothers and sisters or tribe members would find them as they walked on what is now the plains of Wyoming. But nobody did. On the fourth day the boys suddenly had a feeling that they were being followed. They looked around and in the distance saw Mato, the bear. This was no ordinary bear, but a giant bear, so huge that the boys would make only a small mouthful for him. He had smelled the boys and came in search of that mouthful. He came so close that the earth trembled with each step he took. The boys started running, looking for a place to hide, they found none. The grizzly was much, much faster than they. They stumbled, and the bear was almost upon them. They could see his red, wide-open jaws full of enormous teeth. They could smell his hot breath. The boys were old enough to have learned to pray, and the called upon Wakan Tanka, the Creator: “Tunkashila, Grandfather, have pity, save us.” All at once the earth shook and began to rise. The boys rose with it. Out of the earth came a cone of rock going up, up, up until it rose more than a thousand feet high. And the boys were on top of it. Mato the bear was disappointed to see his meal disappearing into the clouds. This grizzly was so huge that he could almost reach to the top of the rock when he stood on his hind legs. Almost, but not quite. His claws were as large as a tipi’s lodge poles. Frantically Mato dug his claws into the side of the rock, trying to get up, trying to eat those boys. As he did so, he made big scratches in the sides of the towering rock. He tried every spot, every side. He scratched up the rock all around, but it was no use. They boys watched him wearing himself out, getting tired, giving up. They finally saw him going away, a huge, growling, grunting mountain disappearing over the horizon. The boys were saved by Wanblee, the eagle, who has always been a friend to our people. It was the great eagle that let the boys grab hold of him and carried them safely back to their village. While we were hiking around Devil’s Tower I saw someone climbing up the mountain. At first I did a double take. And yes they were actually climbing up the mountain. I was so impressed. As we keep walking around the rock formation I noticed more and more rock climbers. I was downright intrigued at this point. We asked a local about the climbers. He informed us that people were always coming out to Devils Tower to rock climb. At this point I was thinking, “Sign me up”. Heights have never scared me. As a bit of an adrenaline junkie I think I am the opposite. I long for the thrill of standing near an deep edge. Ever since that day I knew I wanted to rock climb. I just didn’t really know where to start. Until this past weekend. Since I am a newly hired Adventure Leadership Staff member at East Carolina Univeristy I was give the opportunity to go on the training trip to Lake James and Rocky Mountain. It was the perfect weekend getaway. I used to think camping was just throwing up some tents and sleeping outside. Girl Scouts was a great starting place but no where near the intense I hope to do more of. This weekend I learned how to start a fire, cut a tree in half with a portable blade, put of a tent, and do a t-rescue in the canoe. And that is just the beginning. Adventure is not about how talented or spectacular you are, it is about growth and development. Most things take time and practice. While I was defiantly not an expert climbing I pushed myself to try something new. In life there are things that will be believed to be impossible. Yet, as soon as we go to attempt them they are completely plausible. I have surprised myself. Never doubt yourself. You might surprise yourself at all the things you can accomplish. Here is my review of the places we went to. If you are looking for a great camping spot look no further. Lake James had a range of camping spots for those who want to do some intense “leave no trace” (LNT) camping and those who still want bathroom facilities and showers but still want to experience the great outdoors. The first night we stayed at a campground in Lake James that had really nice showers, bathrooms, and a dish-washing station. The next day we paddled out in canoes to an island on Lake James to camp for the night. There was a bathroom that consisted of a hole in the ground. This campsite was LNT and all of our trash we had to carry with us. The lake was cool and nice to swim in. Staying in the island defiantly felt secluded in nature. I am a beginner climber for sure. I only went rock climbing indoors a few times over the past six months before I ventured outdoors to climb. Rocky Mountain is a great place to start rock climbing or to enjoy lead climbing on the taller end of the mountain. 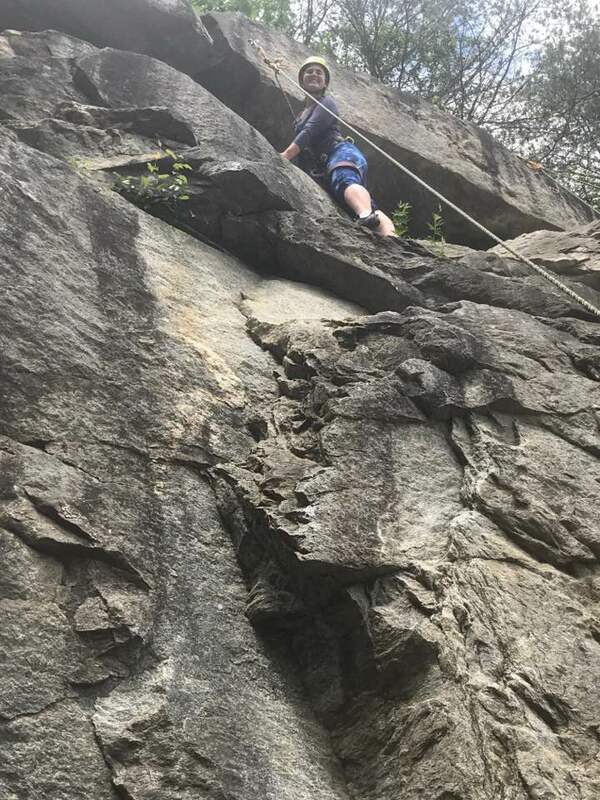 It was an adventurous experience and great introduction to rock climbing.